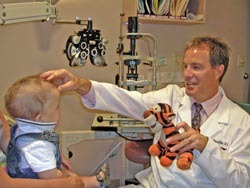 At Berkshire Eye Center, we offer routine and comprehensive eye exams to patients of all ages. We provide newborn evaluations, exams and medical care for young & school-aged children, and treatment of age related conditions in adults and the elderly. When you come in for a routine eye appointment our doctors and clinical staff will provide several tests to evaluate the health of your vision. These routine evaluations typically include a refractive test, color blindness test, ocular pressure check, peripheral vision check, and review your overall eye health and vision. If any findings are discovered or diagnosed during the exam, then further tests may be performed or scheduled at a later date for further evaluation. When making an appointment with us over the phone, please be sure to have all of your insurance information available at the time you book an appointment. We will need the name of your insurance carrier, your ID#, the primary cardholder’s date of birth and social security number, and your contact and demographic information. If you are calling to schedule an appointment for a family member, you will need to make sure you have all of their current information for their insurance and demographics as well. Please make sure to bring in your insurance card or proof of insurance at each visit with us. We are committed to delivering the very best in eye care. Our team of doctors, technicians, opticians, and support staff will work to treat each of our patients with dignity and respect; provide dependable and courteous service; communicate clearly and honestly; protect patient confidentiality; and earn our patients' trust. © Copyright 2015 Berkshire Eye Center. All Rights Reserved. Medical website by Glacial Multimedia.